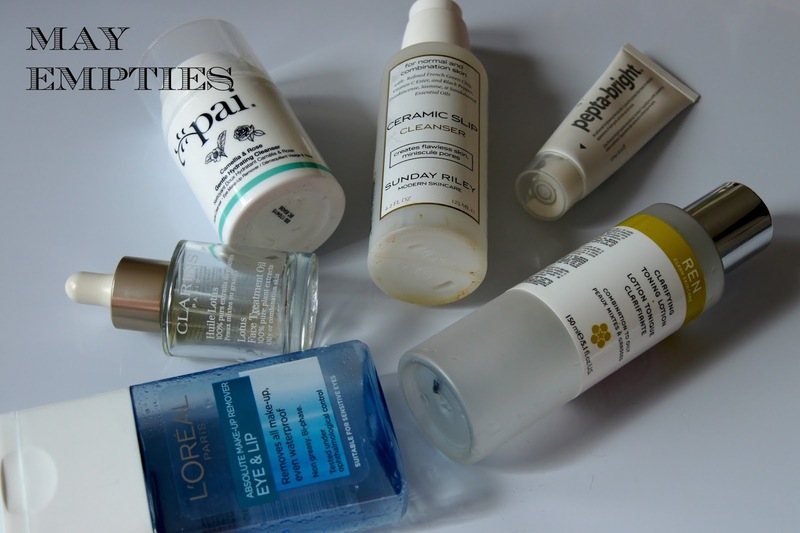 A quick pictorial round up of my empties from last month and mini reviews on the standouts! 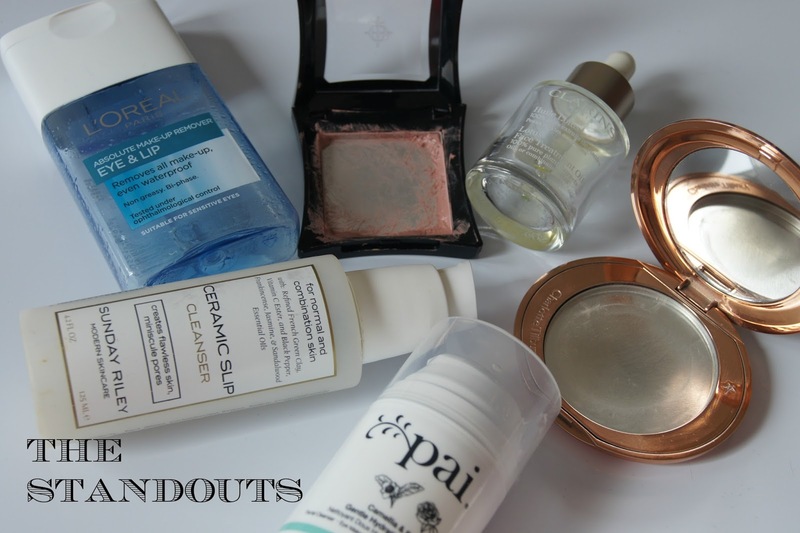 Quite a few excellent products this month and some definite repurchases! Before we get into the standouts a couple of comments on other bits. MAC Cosmo fell foul to the heat of Dubai and snapped-it's a great neutral for the office and you can see it in action here. I cant believe I didn't review the Estee Lauder Double Wear Light but my thoughts are: poor colour range (the lightest shade is a shade too dark for me but ok with some serious blending), applies best with fingers, a brush swallows up too much product, great coverage for a 'light' foundation but has a tendency to feel quite tacky on the skin. Compact size and plastic tube makes it great for travelling. Looks better and better throughout the day. A brilliant little bi-phase eye make up remover that removes heavy eye make up simply and efficiently without being too greasy and something I will definitely stock up on in the UK. However the packaging has one major design fault in that when you try and dispense the liquid onto a cotton pad it literally goes everywhere and it wastes quite a lot. I tried everything to control it but it was virtually impossible. Apart from that, fab little product! I loved this cream blush from Illamasqua. 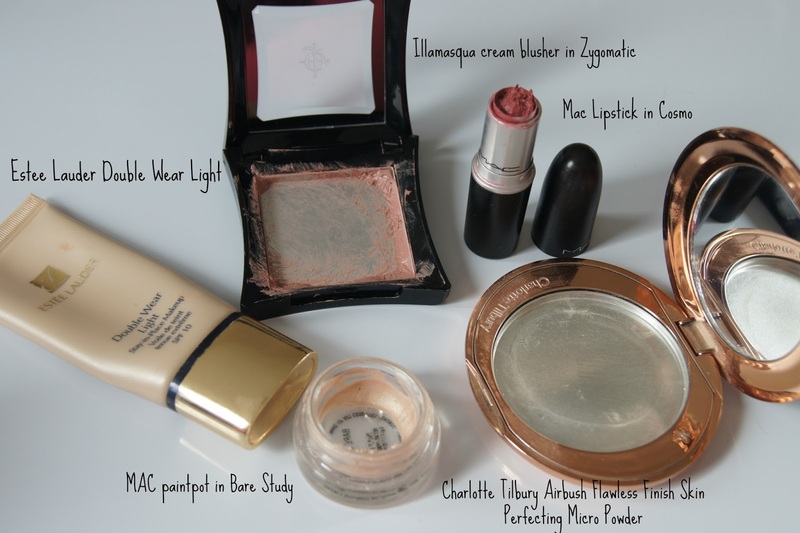 It has quite a dewy finish and you need to leave it to dry that extra minute if you're going to powder over the top. Brilliant applied with fingers or a stippling brush, it doesn't mess up your foundation underneath and gives cheeks a super healthy glow. Probably best avoided if you have super oily skin but this will be a godsend for dry cheeked gals! I convinced Sarah from andbeautyorsomething to go out and buy this! Zygomatic is described as a 'naked pink brown' which is pretty much spot on and brilliant on pale skin tones. It just gives me skin a little something extra. Holy Grail. Fantastic for oily or problematic skin, I absolutely adore this heady oil-it really did wonders for my skin. You can read a full review here-and then go out and immediately purchase! I totally fell for this powder despite the fact (a) you need to remortgage to buy it and (b) I almost cried when I hit pan which happened way too quickly. It's a miracle powder, it literally mattifies and blurs imperfections with one swish of a brush. Find my full review here. The packaging was divine as well. One of Charlottes best products. Featured on my blog just yesterday, this cream cleanser is a real treat for the skin. It's super effective at removing make up and your skin feels soft, supple and nourished afterwards. I almost didn't need to use a second cleanser because I knew that this had done the job and my skin was clean after using it. A definite staple. Finally another brilliant cleanser and definitely one that lives up to the hype around it! I love this light, gel based cocktail of vitamins, minerals and essential oils. For me this is the perfect 'morning cleanse'-French Green Clay draws out any impurities while Vitamin C stimulates collagen production for a plumper, healthier complexion. Black Pepper promotes circulation, Sandalwood combats areas of sensitivity, Jasmine soothes & restores while Frankincense encourages healthy cell growth for firmer, porcelain-smooth skin. Yes it's hyped, yes it's expensive but I think it's totally worth it!